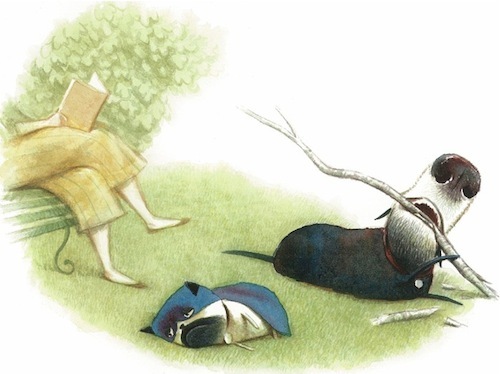 I am a dog person, and my attraction to those of the canine persuasion extends to my taste in picture books. 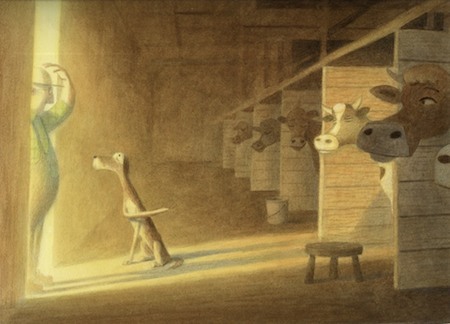 Old dogs and pups, dogs in capes, stinky dogs, dogs who run curio museums, dogs named Plum, dog-like coyotes and wolves, and just plain old mutts; each in possession of some unique quality of dog captured and expressed by the best writers and illustrators around. I love ’em all, so why not run them in a pack? Gather all the reviews in one post, for my own amusement, yes, but also to provide a helpful list for fellow barkophiles in search of beautiful dog books. Of course, this is but a smattering of what is available, and there are still dog books on my shelves that have yet to make it to this blog, but for now I invite you to play ball with these titles, which are listed in no particular order. Click on the links for the original, and in most cases, much longer reviews. 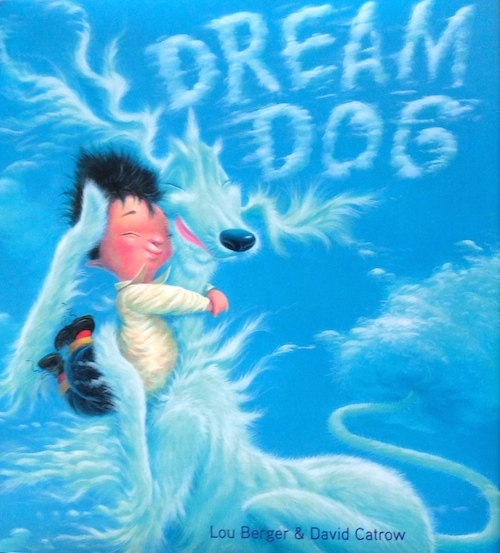 I want to start with DREAM DOG by Lou Berger, with illustrations by David Catrow. Dogs display an infinite range of emotions, and not just on their faces. From a wave of a tail to the swivel of an ear, dogs radiate emotion with their entire body. Not only has David Catrow mastered the art of dog expressiveness, together Berger and Catrow have captured the joy so many of us feel in the presence of a dog. 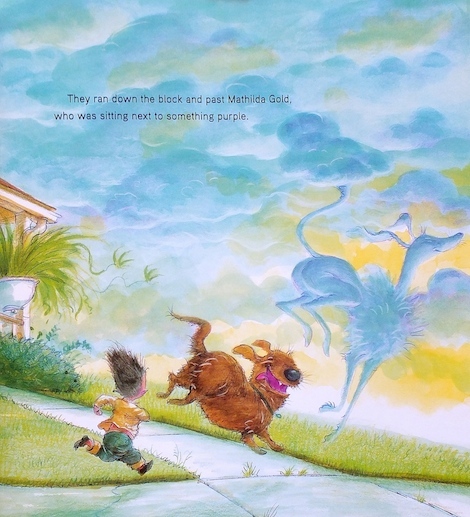 Dream Dog is a wondrous, funny book, full of kid energy and soaring hearts (mostly my own). Frustratingly dogless, Harry uses his X-35 Infra-Rocket Imagination Helmet to conjure up a dream dog because his father, sensitized by his work in a pepper factory, sneezes around real dogs. Harry’s dog Waffle is big and friendly – an adorable mix of actual breeds and a boy’s sweet imagination. Eventually, Harry’s dad gets another job and buys Harry a real dog, who he names Bumper. All three become friends until one day Waffle races after a cloud and simply wafts away, “woofing happily” as Bumper and Harry play in the field below. Dream Dog will hit you in the feels in the best possible way. 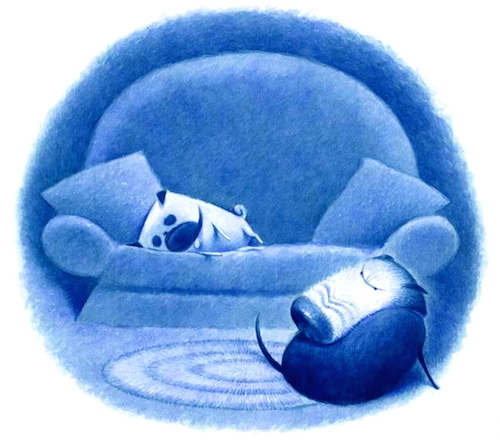 Speaking of books that drive straight to the heart, I cannot say enough about the Zorro and Mister Bud series about two unlikely housemutts who have (so far) starred in three books: SAY HELLO TO ZORRO, ZORRO GETS AN OUTFIT, and MISTER BUD WEARS THE CONE. 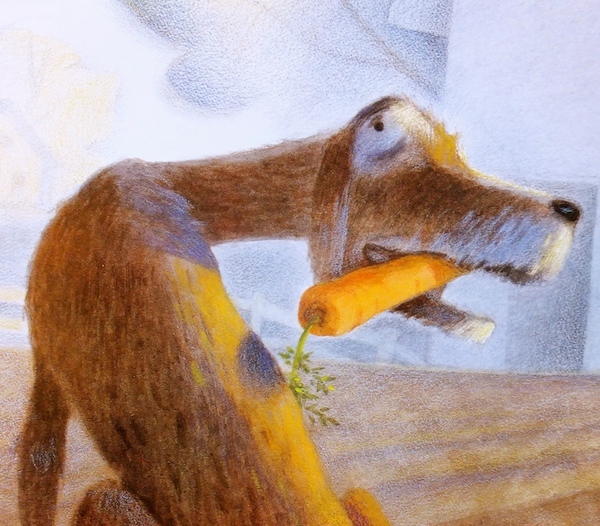 Carter Goodrich has not only created funny and exceedingly loveable characters, he has also imbued them with the full range of dog emotion, from joy to shame, without losing sight of their essential dogginess. The ample-snouted Mister Bud and his energetic roomie Zorro (a pug) have the sort of localized adventures familiar to most dogs (and their people) and it is in these otherwise ‘normal’ situations that Goodrich finds the extraordinary: the moments of emotional truth, the humour, the pathos, and the beautifully observant way he expresses the body language of dogs. What makes a great illustration? It’s never one thing. Some artists have a flare for colour, others excel at characterization. And then, there is line. It can make or break an illustration, but in the right hands a single line, or a thousand, elevates the subject matter, in this case an odoriferous dog, to a thing of pure beauty. Catherine Rayner is a master of all three, infusing her newest book Smelly Louie with an artistry one might not associate with filth. Like Louie however, Rayner relishes dirt – in all its malodorous and absurdly gorgeous possibilities. The opening pages of Smelly Louie are splattered with paw prints and tiny flies as Louie takes the walk of shame to a bubble-filled bathtub. As anyone who has ever bathed a dog, it’s a lot of effort for very little gain, especially for the pooch. In Louie’s case, smelling like roses and apple blossom is not something he has ever aspired to, and he spends the rest of the book trying to recover his ‘Special Smell’. 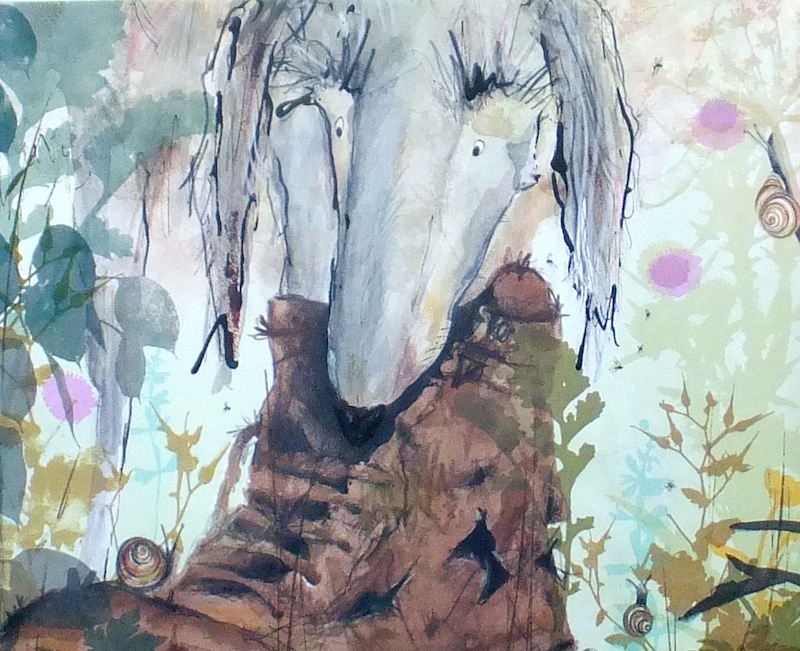 Admiring the stench wafting off a fox in the garden, Louie inquires as to its origin, and the fox directs him toward an old boot in the brambles. Louie gets progressively dirtier as he explores the neighbourhood, seeking help from the various creatures he encounters. Wiggling in ‘wonderfully whiffy’ sludge and ‘pongy ponds’, Louie layers smell after smell like a true stink connoisseur until he finally achieves his own personal nirvana – his Special Smell. Rayner does a magnificent job visualizing Louie’s befouled, fly-ridden fur. 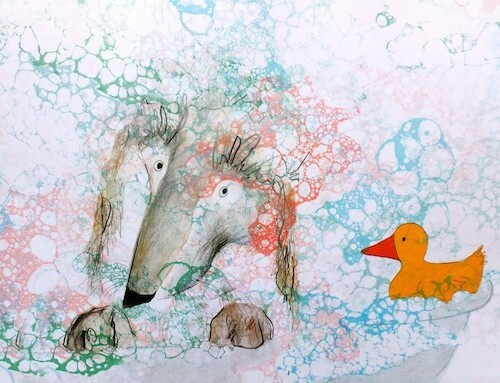 In squibbles, splotches, and tangled strokes of watercolour and inks of varying widths and dirt tones, Louie’s coat comes alive with scent. Somehow, he is still beautiful, and the book itself is one of Rayner’s loveliest, and funniest outings. Perhaps it’s the joy Louie radiates as he returns home, proud and unrepentant, a haze of stench in his wake. Sadly, as Louie discovers shortly after entering the house, non-canines rarely appreciate the complexity or skill involved in the creation of a Special Smell. Sorry pal, we just don’t have the snout for it. All dogs smell. Fortunately, I had a virus a few years ago that, according to the doctor, laid a ‘catastrophic path of destruction’ deep into my nasal passages, rendering me unable to detect the finer nuances of canine stink. If I were to interpret my dog’s Special Smell, I would say it’s a mixture of old dirty pillow and biscuit crumbs, but I don’t think I’m getting the full olfactory picture. This is not the case with Smelly Louie. 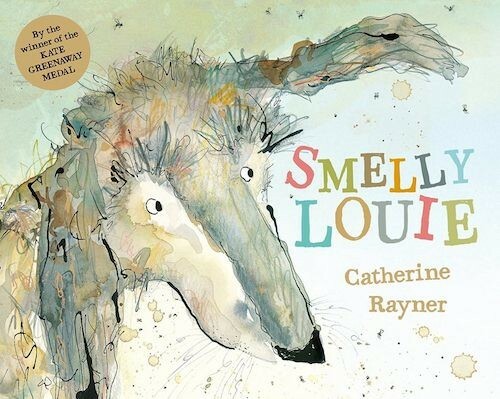 In a visual medium, Rayner plays with our senses, beautifully conveying the very essence of Louie – his smell, his Special Smell, and like all dogs, we get the sense that this is everything he wants us to know about him. Award-winning author and illustrator Catherine Rayner was born in Harrogate and now lives in Edinburgh. She has a BA Hons in Visual Communication and Illustration from Leeds College of Art and Edinburgh College of Art. Catherine’s other books include Sylvia and Bird, Norris, the Bear who Shared, Posy, Ernest and Solomon Crocodile. Harris Finds His Feet (reviewed HERE) won the 2009 Kate Greenaway Medal. 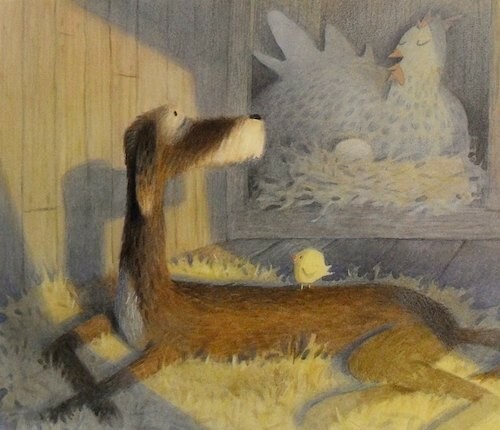 I found Plumdog Blog about a year after its inception. 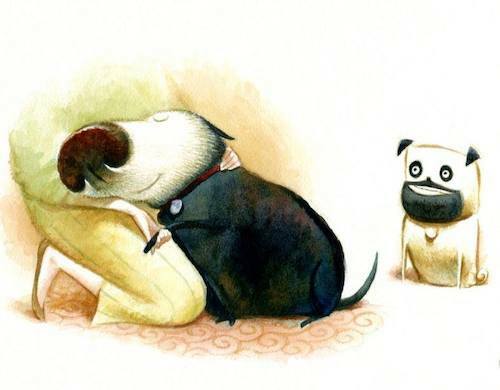 I’m not entirely sure how I stumbled upon this incredibly endearing, beautifully illustrated online diary of a dog and her owner, but once I did, I was hooked. 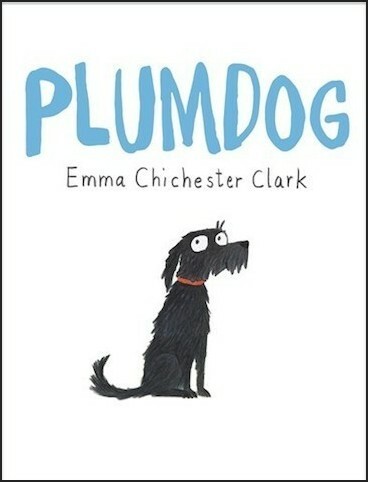 Written by British illustrator Emma Chichester Clark, or should I say, her dog Plum (with help from Emma), Plumdog Blog is a cleverly conceived and brilliantly executed glimpse into the life of a whippet/jack russell/poodle cross, and by extension, her human mum. As a children’s literature blogger, I am online for big chunks of the day – to the point of overstimulation. 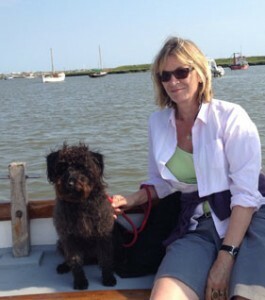 Plumdog, whenever it is posted (usually every two or three days), quiets the noise, instantly drawing me into a simpler, softer world – Plum’s world, but also a very English world, where grass stays green all year long, it rains an awful lot, and life, while sometimes harried, is always sweet. Plumdog collects the best of the posts in book form, and it is most definitely – one of the best books of the year. Plumdog presents us with a world seen from an unusual perspective – the daily life of an illustrator from a dog’s point of view, and a dog’s life from the dog’s point of view. Beyond the obvious (and delightful) humour of the situation, what becomes clear, especially when read as a collection, is that Emma and Plum are living their lives at different speeds. Emma’s life, as one would expect of a prolific and popular illustrator, is a whirlwind of public/personal activity and looming deadlines, much of it (but not all) spent in the company of her observant little pup. Unlike humans, dogs are always in the moment – a point that is wondrously captured in Plumdog. We see, and more importantly, feel Plum’s joyful appreciation of the now, which more often than not revolves around water. Any puddle, stream, or lake will do, regardless of the weather. I think I know a dog or two like that. Still, life does not always go Plum’s way. Routines are interrupted, relationships with other dogs are mostly – but not always, friendly, and some days Plum is left behind, not knowing when or even if Emma will return (inspiring one of the most poignant moments in the book). 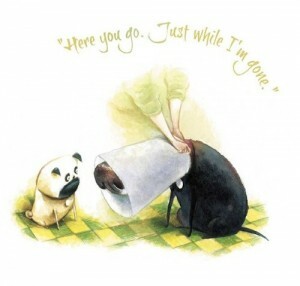 I’ve often wondered what dogs (and cats) think when we leave them at home. Do they feel abandoned, or do they believe we are waiting just outside the door, and if so, do they think we are idiots? How do dogs experience time? Like Emma (and anthropomorphizers everywhere), I just naturally assume that dogs are capable of complex thought, which makes Plumdog a useful and exceedingly charming guide to the inner workings of a dog’s mind and, in all other ways, a perfect gem of a picture book. Prior to Plumdog Blog, I was a distant admirer of Emma Chichester Clark, but not overly familiar with her work. It was simply a matter of proximity – her books are not as well known in North America as they are in the UK and Europe. Since then, however, I have become a true fan of her art, and am slowly building my collection of books. 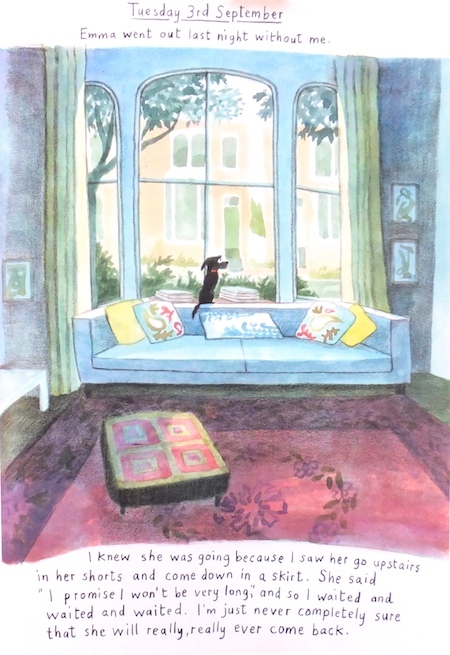 One might assume that because Plumdog is a series of journal entries the art is mere dressing for Plum’s story – a visual record rather than fully realized illustrations, but this is not the case. The watercolours, especially the full-page spreads, are ravishing. Come for the dog, stay for the art! I am simply in awe of her ability to capture expression and body language with minimal brushstrokes, and the settings – interior and particularly exterior, are breathtaking. 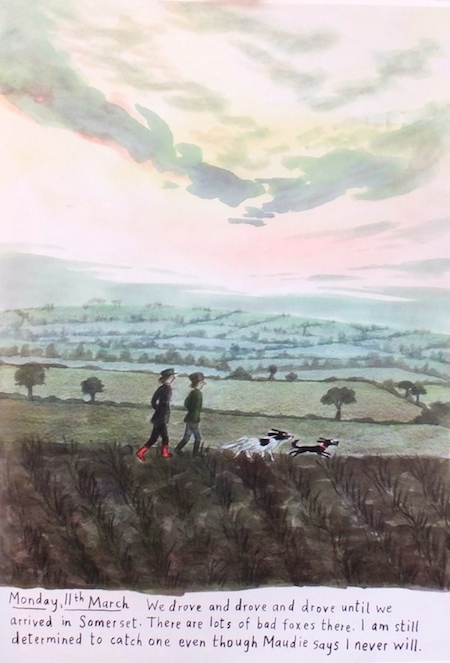 There is an immediacy to the illustrations which suggests a very sure (and quick) hand, and indeed, in Plumdog Blog (but not the book) the paper is often visibly warped by the watercolour. These are true in the moment creations, but taken as a whole, Plumdog weaves a tale that is full of warmth, humour, and above all, pure dog joy. 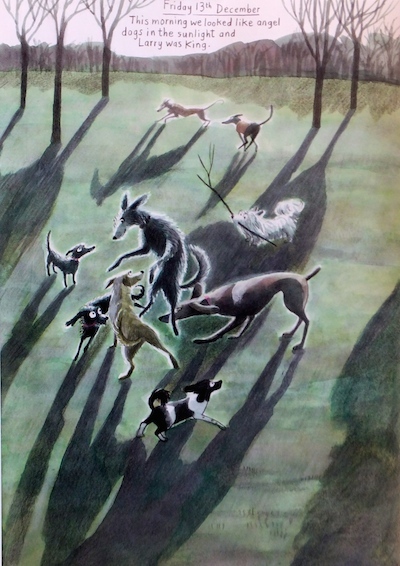 According to her website, Emma Chichester Clark was ‘born in Hyde Park Corner, London, but grew up in the countryside in Ireland in an old white farmhouse surrounded by fields.’ A graduate of the Royal College of Art in London (tutored by none other than Quentin Blake and Michael Foreman, among others), Emma has illustrated many books, including the very popular Blue Kangaroo series, as well as books by Roald Dahl, Kevin Crossley, and Michael Morpurgo. She lives in West London with her husband, stepsons, and a lovely little dog named Plum. 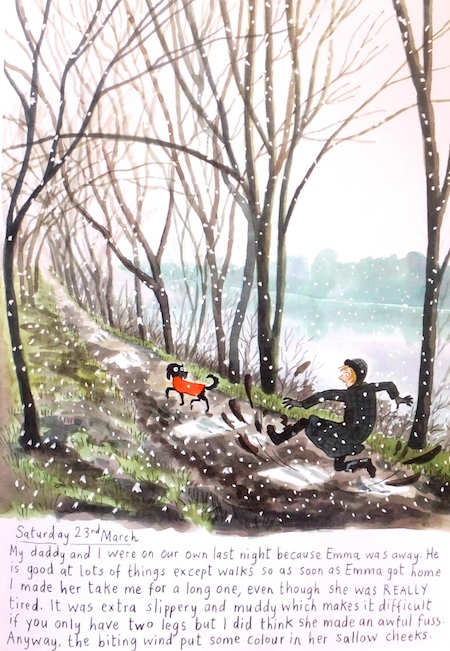 And for the continuing adventures of Plum, click on PLUMDOG BLOG. I demand it! Some books radiate charm. Often, it’s not any one factor, but a seamless blend of clever writing, exquisite illustration, and a third, more elusive ingredient – a goodness, for lack of a better word, superseding all. This is Carter Goodrich territory. With the release of Mister Bud Wears the Cone, the third book in his dog-centric series, I can state unequivocally (and with a great deal of affection), the man knows how to charm. Mister Bud Wears the Cone further examines the sometimes fractious relationship between two dogs: Mister Bud, a generously snouted, routine-loving mutt, and Zorro, a tiny, goatee’d pug. 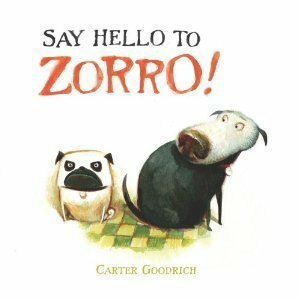 In the first book of the series, Say Hello to Zorro, Mister Bud is introduced to Zorro, his new ‘sibling’, and is none too pleased to share his comfortable, predictable life with the eager young pup. 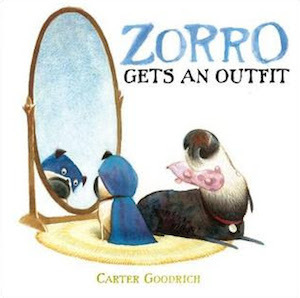 In the second book, Zorro Gets an Outfit, it is the pug who is faced with an untenable situation, in this case an embarrassing piece of clothing, and like Mister Bud, his path toward resolution is both funny and sweet. In Mister Bud Wears the Cone, the bone is once again tossed to Mister Bud, who in this outing must deal with that most intrusive of protective pet care devices – the dreaded cone of shame. As the story opens, Mister Bud has developed a hot spot on his flank, which he can’t stop bothering. His mother (who like all humans in this series is never fully depicted), comforts Mister Bud with ointment and hugs, which infuriates Zorro. Not only is he grabbing all the attention, his ailment is delaying their shared schedule of ‘biscuit then a walk time.’ It gets worse. Mister Bud must wear the cone. Mister Bud hates the cone. For awhile, he has an ally in Zorro, who tries to help Mister Bud remove it, but when all attempts fail, Zorro loses interest. Like all similarly afflicted dogs, Mister Bud is a half-blind, stumbling disaster with the cumbersome cone. Like all siblings, Zorro can’t help teasing Mister Bud, laughing at his clumsiness while helping himself to the biscuits. When Zorro takes his favourite toy, Mister Bud runs after the pug and the cone knocks over a lamp, breaking it. Never let it be said dogs aren’t capable of schadenfreude. While Mister Bud cowers under a chair, consumed with guilt, Zorro eagerly awaits the inevitable parental reprimand. But…as anyone who has ever been around an animal wearing a cone knows, it is impossible to feel anything but sympathy, and in Mister Bud Wears the Cone, generosity of the heart, and of the treat, is a given. 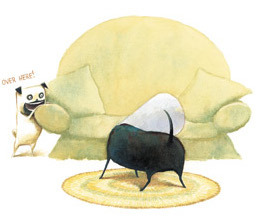 The continuing adventures of Mister Bud and Zorro are meant to be funny and entertaining, and they most certainly are, but as an illustrator and dog lover, what I find particularly interesting is how Goodrich imbues his pooches with pure canine authenticity. They are the very personification of the complex emotional lives of dogs. This is no small feat. Goodrich is a master of comic characterization, and from schnozz to tiny paws, these dogs are hilarious. Their wildly expressive and beautifully exaggerated features might exclude them from the Westminster Dog Show, but Goodrich never loses sight of their essential dogness. It’s in their physicality – in the way they hold their bodies, the perkiness of their ears, how they lean in, how they nap – it’s all dog, and because of this, these tells, they radiate emotion. It’s easy to love these guys – to feel for them, to laugh at their predicaments, to sympathize not only with Mister Bud’s frustrations, but also Zorro’s. Anyone who has ever had a sibling, or is the parent of siblings, will recognize the rivalries, but also the companionship that forgives all. Anyone who has ever had a dog will see their own mutt in these comical canines, cone or no cone. 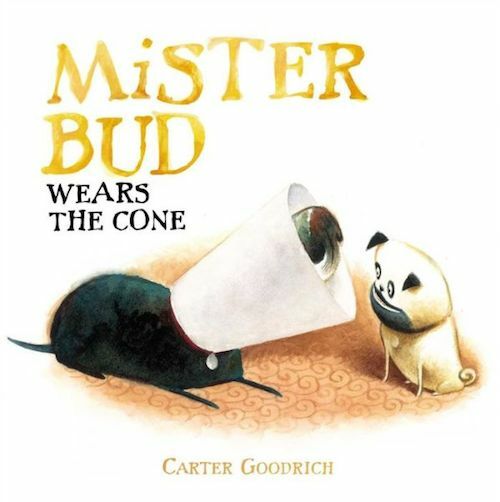 And even if none of the above applies, Mister Bud Wears the Cone is just a darn good story, with heart-thumping emotion, loveable characters, and spectacular art. My favourite doggy in the world underwent surgery several weeks ago for the removal of five lumps (all benign, thankfully.) When Maggie was released the day after surgery, she had two large shaved patches on both sides of her torso, another two on her neck, and multiple stitches. Doped up and disoriented, she emerged out of the back of the vet’s office wearing a comically large cone and a woeful, accusatory expression. In short, she looked miserable, very much like Mister Bud. The cone didn’t last beyond the car, the patient didn’t bother with her wounds (much), and once the daily schedule of biscuit-then-nap-time resumed, she relaxed. Like Mister Bud and Zorro, it’s all about the routine. And the snacks. 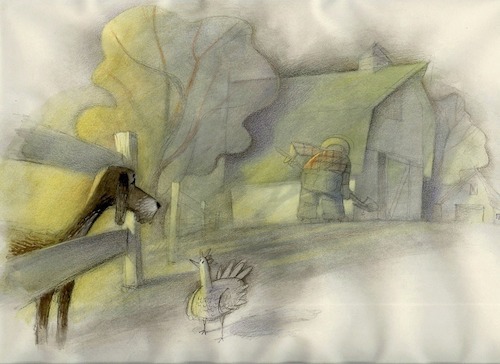 I am a long-time fan of Carter Goodrich, having been an illustration junkie for many years. Particular favourites are his numerous New Yorker covers, and his character designs for Despicable Me, Ratatouille, The Croods, and Finding Nemo, among others. A Rhode Island School of Design graduate, Mr Goodrich has illustrated a number of children’s picture books, including A Creature Was Stirring, The Hermit Crab, and the aforementioned Say Hello to Zorro and Zorro Gets an Outfit. Fingers (and paws) crossed, Mister Bud Wears the Cone will not be the last in this brilliant, and beautifully imagined series.